** Refer Edward Alston 3236. ALSTON (EDWARD), B.A., from Sidney, Sussex, Coll. Cambridge, 1665 ; M.A. 1668 ; (Incorp. 1669) B.D. 1675. Brother of Charles, Archdeacon of Middlesex. Admitted to Gray's Inn 1662; Rector of Brantham, Suffolk, 1679, of Newton, juxta Sudbury, 1683. EAST BERGHOLT TOWN BOOK BEGINS 21 ELIZ. 1579. 1701: There was divers loose pieces of Brass in the town chest wch together weighed 80 lb. and odd wch were ordered by ye visitors to be sold and with the money a Comunion Salver to be bought for the use of the Church and accordingly there was a Salver bought and now put into the town chest weight eight ounces three quarters wth this inscription "Edward Alston B.D. Rect. & Mr. John Leech & Mr. John Parker Churchwardens of the Parish of East Bergholt in Suffolk Anno Domini 1701." There were 30 pieces of brass. BITS ABOUT BERGHOLT, by Villager, "December 11 1874 - Mr Wellbank (an unpopular incumbent) was followed by Mr. Edward Alstone a very different man. He seems to have been popular in the parish and many of the town meetings were held at the Rectory. In January 24th 1681 we found him obliging his neighbour the Rector of Wenham Magna by officiating at a funeral in his stead. Very graphically did he describe the various persons whose names he entered in the register making such notes as these "an almsman, a weaver, a Town charge, a vagrant of Gravesend, a poor chairmaker, a knacker, a compter, a great town charge and a Potash maker." He was required in some cases to state whether persons were possessed of L600 or not and very quaintly does he record of Henry Godfrey that "he was not worth 6 farthings as he saith." In 1683 he recorded the baptism of his child Nicholas son of Edward Alston by Frances his wife, at church. Were the last words that poor Narcissa spoke." On March 28 1687 we find "This is a true account of all the Burials in East Bergholt the last year past and that the several persons were buried in woollen and affidavit made of the same (except John Matthews and Ann wife of Joseph Clark who were punished according to the Statute). Paid to Mr. Alston for a licence and marriage of Katherin Harmon 23s. 6d. Paid more to the King's Duty 2s. 6d. More to Parkin's (the Clark) 6d. More to two horses journey to carry them to Ramsey 3s. Bill, 24 June 1706, by Edward Allston of East Bergholt, co. Suffolk v. Dorothy Reynolds and James Hovell. The defendant Dorothy Reynolds of Ipswich, co. Sussex, widow, daughter of . . . . . Newton of East Bergholt widow, has for several years last past consulted with Orator as to the management of her affairs. The suit relates only to the purchase by said Dorothy of some lands in Suffolk and Essex, when complainant acted as her security. presentation for fulfilment of the above condition ; it is supposed these are in Alston's possession, but he denies it, sometimes also denying the fact of his having had access to the papers. procurations, and about L150 for the finishing of the parsonage house. He inspected the papers as requested, but always in the presence of the said Mercy and others. THE WILL of REV EDWARD ALSTON B.D. Parson of Parish of Brantham with the Chapel of East Berghold co. Suffolk Diocese of Norwich, also Patron and Rector of the Parsonage of Newton near Sudbury co. Suffolk. I desire to be buried in the Chancel of the parich church of Newton near Sudbury as near my wife as may be. I give to my eldest son Thomas Alston my messuage and lands in Boxford and Groton with Gents or Parsons Meadow given me by my grandfather Weatherel, also 4 acres of meadow ground lying in Fryers meadow Sudbury and Great Cornard, also my messuage and lands belonging to my farm in Assington Newton and Cornard called the Spite house now in the possession of John Creswell, he to pay my executors L150 with interest, according to the mortgage given by him and his wife Mary, also to said son Thomas my messuage and farm in Botishal Cambridgshire which I had with his mother. which I am at present, the incumbent and which I lately purchased. I give to Mary Alston the edlest daughter of my son Thomas a small diamond ring with a single stone. I give to my son William and his heirs my freehold tenement in Newton. I give to my youngest son Samuel and his heirs the White Lion Inn in Brantham, Suffolk with the orchard and all lands belonging hereto, also my copyhold messuage called Skinners in East Berghold with orchard close and houses, holden of the Manor of Old Hall. I give also to Samuel L150 with lawful interest lent on mortgage to my son Thomas and the residue of my real and personal estate unbequeathed. My son William to have all my divinity books, sermons and MSS, my physic books with my receipts relating to physic or surgery. I give to my son Thomas all my law books. I desire my son Samuel to pay to the poor of Brantham 20/- and East Bergholt 40/- and to Newton 40/- and I appoint him sole executor. Witnesses John Simons, James Hare, John Hills. Suffolk Man Family's i 176 puts Edwards death date at 18 Feb 1722 aged 79. His ledger stone in the Chancel floor at Newton (1899) exhibits the Alston Arms - Azure 10 'etoiles 4 3 2 and 1 with helmet mantling and crest a crescent. 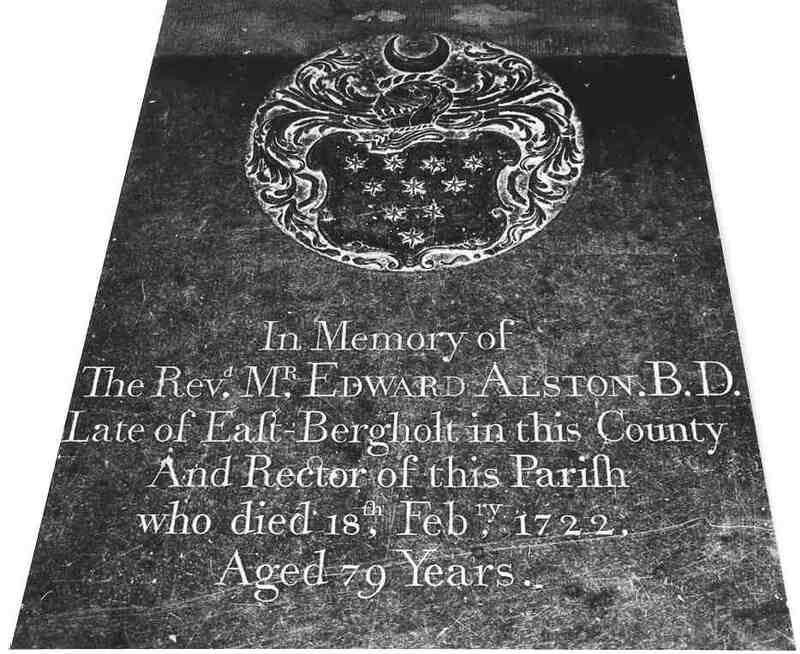 There is an inscription "In memory of the Rev Edward Alston BD late of East Bergholt in this County, and Rector of this Parish, who died 18 Feb 1722 aged 79 years". Miss Ruth Alston has an old account book belonging to Edward (Alston Fenn 1965). Within the Communion rails on a black marble on the South side. the Revd. Mr. Edward Alston, B.D. Edward may have lived at Brooks, Newton - research needed to confrm this. Inscription on a Cup of Silver, Newton. Dat Deo et Ecclesiae de Newton Edws Alston Rector. Was Edward involved in gifting this chalice to All Saints Newton? Plain Chalice 1638. Slightly bell shaped cup on baluster. Marked fully on the cup and with Lion passant on the foot. About 8 inches high. Maker S.A. in monogram. (J.P. 123 L15) Inscription - Hauriat hinc populus vitam de sanguine sacro. Inflicto aeternis quem fudit vulnere Cristus Dat Deo et Ecclesia de Newton Edrus Alston Rector. F.Q.E.A. A "rough" translation is "Here the people drink deep of the life which the eternal Christ poured out in his sacred blood through his wounds"